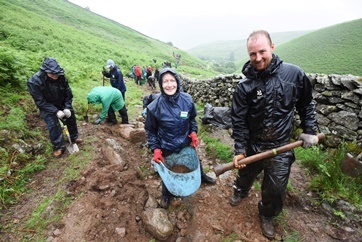 Tim Farron MP and the head of the National Trust visited the Lake District to celebrate 10 years of the work of volunteers who help to repair and maintain some of the most popular paths in the mountains. 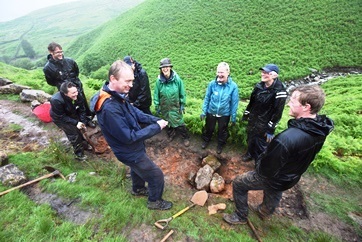 Dame Helen Ghosh visited Tongue Gill near Grasmere to meet the volunteers at work. She joined them in helping to re-route and repair sections of the busy Wainwright Coast to Coast route which was damaged by landslips in Storm Desmond in December 2015. Fix the Fells is a partnership programme between the National Trust, the Lake District National Park, Natural England, Friends of the Lake District and Nurture Lakeland. 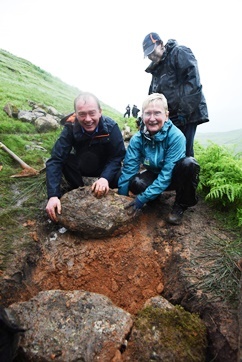 The aim of the Fix the Fells partnership is to protect the spectacular Lakeland fells from erosion and damage by both repairing and maintaining the upland paths of the Lake District. Over the past 15 years Fix the Fells has brought significant improvements to more than 200 paths in the Lake District fells. 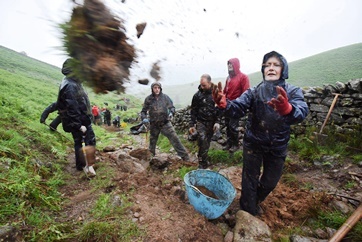 The work is carried out by teams of National Trust Rangers, who work on behalf of the partnership, along with an army of over 100 volunteers. The volunteers are called “Lengthsmen” – a term from medieval times when lengthsmen would be paid to walk the length of the parish and repair any roads and unblock ditches.